What are Bylaws and why do I need them? Bylaws are the general rules and operating procedures for your committee. Bylaws are important to establish because they will help guide your committee when operational questions arise. At minimum, topics such as the general purpose/functions of the advisory committee, committee member requirements, how meetings are conducted, voting procedures, election of officers, and what officers the committee will have and their duties should be included. Each advisory committee should establish its own criteria and guidelines for member recruitment, selection, appointment and replacement. Committee membership should be reviewed and updated yearly to ensure broad-based representation of the industry and to ensure that the work of the committee continues. Why should I have Officers? 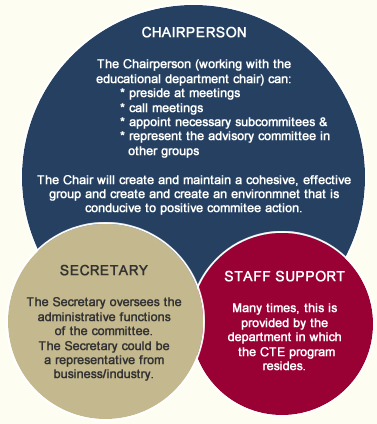 Officers, working closely with the educational department chair, can save time for teachers/administrators, and it is strongly recommended that officers take active roles early in the formation of the committee. Office selection can be done at the first meeting of the year and should take place with full participation of all current committee members. How do I select the Chairperson? The chairperson should be from business/industry and is generally selected and voted in to office by the committee. 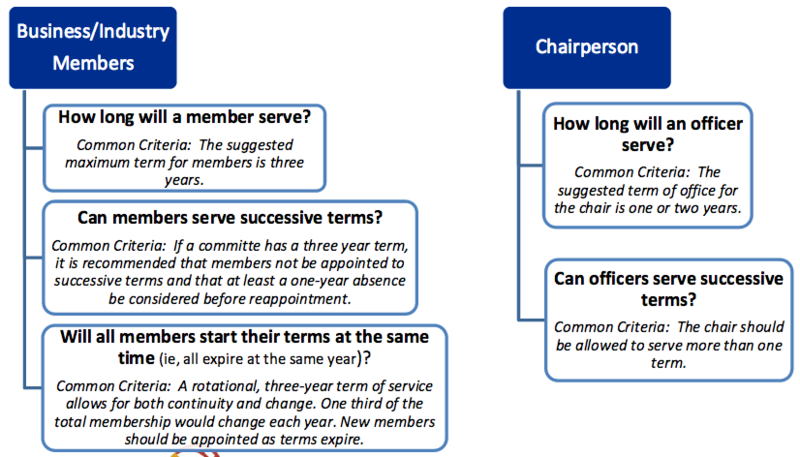 Chairpersons usually serve two year terms. The two main roles of the chair are to set meeting agendas and conduct meetings. CTE program advisory committee’s are good to have. They provide valuable input to what the businesses’ needs are. Committee members, if chosen correctly, and by correctly I mean members from businesses that would provide jobs to those in the field we are teaching—they can even offer experience of equipment that an instructor may want to purchase. Example the instructor may be looking into purchasing a new alignment machine, and one of the members in the committee may have had an experience with the machine you are looking at purchasing, and can give you the pro’s and con’s of the machine. Another example that I have, I was looking at purchasing a transmission flushing machine. With the input of the committee they recommended that the purchase would be better used in something else, and after some thought, that’s true. If a student would have to use one after employment from a college, he or she can learn how it operates in just a few minutes. So this can be true in other equipment, saving our budgets. The members also inform me of the needs that their shop requires, and out of this I can blend those needs into my instruction.